Note the bolded abilities. These abilities are common to all mecha modes. If a common ability suffers impairment all modes are affected. For example, while in Fighter mode if the Speed ability is impaired one rank and is reduced to Good [+2] both the Guardian and Battloid modes take one rank of impairment to Speed. Guardian speed is reduced to Average and Battloid Speed is reduced to Poor [-2]. These Robotech sheets are awesome. I love Robotech, I can deal with the RPG itself, but love seeing other games adapted to play in that setting. Thanks, Dyson. Much appreciated. PDQ actually surprised me by how well it supported Robotech. 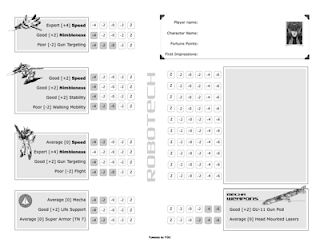 Beautiful part is that PDQ is simple enough of a system to get both the mecha and the character on one sheet.